After the closing scene of Virginia Repertory Theatre’s The End of War, the audience sat in silence a few seconds before the applause began. It truly takes a while to process this transformative production. Wolf J. Sherrill and Nicklas Aliff. Background: Cellist, Erin Snedecor. Photo by Aaron Sutten. 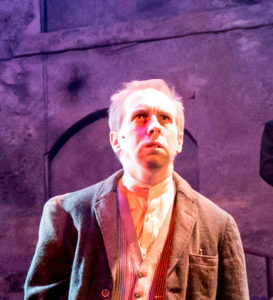 Richmond author David L. Robbins adapted his 2000 novel for the stage, and it comes to life under the masterful and ambitious direction of Nathaniel Shaw, Virginia Rep’s new artistic director. 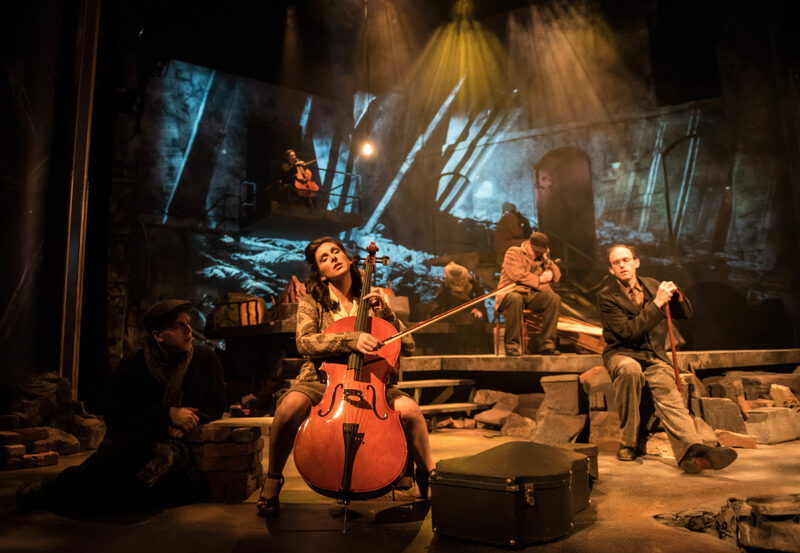 It’s a visually and emotionally stunning production about what humans will do to survive the horrors of war. The world premiere, playing at the November Theatre through March 26, is part of this year’s Acts of Faith Festival. 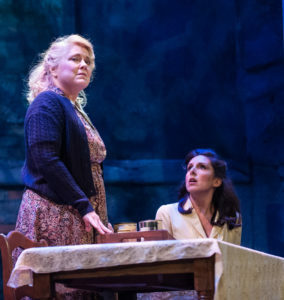 The play tells two parallel stories of the final days of World War II in the spring of 1945, with Russians heading towards Berlin and residents tentatively waiting to see what the arrival of Allied troops will bring. Weary Russian soldiers Konsta (Wolf J. Sherrill) and Ilya (an especially good Nicklas Aliff), punished and in a penal company, are killing their way along the Soviet front towards Berlin. Along the way, they develop a friendship of sorts, sharing secrets. Paige Larson and Eva DeVirgilis. Photo by Aaron Sutten. Scott Wichmann. Photo by Aaron Sutten. In The End of War, there are no heroes, and there are no monsters, just flawed characters doing what they have to in order to survive. In a way, each has to develop a code of ethics and determine what lines can’t be crossed. The actors are all superb, though at times, some actors’ Russian or German accents missed the mark. Perhaps even more than the acting, what dominates The End of War is Ron Keller’s set. It’s like nothing seen in recent memory in Richmond, a bleak, towering masterpiece that serves as Lottie and Freya’s home, the battlefield, the concert hall and Berlin itself. Tennessee Dixon projections on the crumbling ruins help tell the story of the devastation of the Red Army march and the destruction of Germany’s capital. BJ Wilkinson’s lighting is magnificent and effective, as is Julian Evans’ sound design that translates the horrible sounds of war. Cellist Erin Snedecor sits alone on a solitary balcony above the stage, providing haunting music. The End of War can be a difficult production to watch. The stories feel too real and raw at times (I read Robbins’ book and the research for his book was extensive). The production is recommended for ages sixteen and older, but for those teenagers ready to handle the content, it provides an important and soul-wrenching look at humanity and survival. 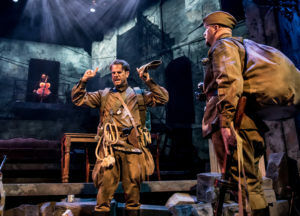 The End of War is showing at Virginia Rep’s November Theatre through March 26. For tickets and showtimes, visit Virginia Rep. For special savings programs including rush ticket info and group discounts, click here.